Random Noodling: Ekphrastic April 2019, Day 6: "Fashion Shop"
Ekphrastic April 2019, Day 6: "Fashion Shop"
Fauvism is the style of les Fauves (French for "the wild beasts"), a group of early twentieth-century modern artists whose works emphasized painterly qualities and strong color over the representational or realistic values retained by Impressionism. "Fashion Shop" (1914) by August Macke [1887-1914]. 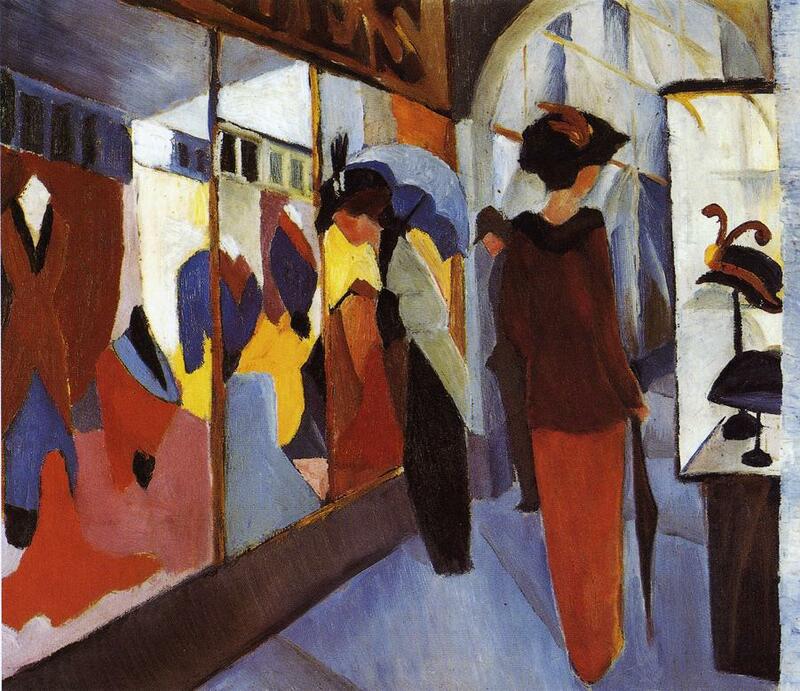 Sadly, Macke, died in France, during the early months of World War I. Even from so long ago, "all the color that is needed" is still true today. Good statement, Diane. Sadly, hats used a lot of birds' feathers in the pursuit of fashion. Catching up on my cheritas today. I love this one!